Apple has determined that, in very rare cases, the battery in the iPod nano (1st generation) that were sold between September 2005 and December 2006 may overheat and pose a safety risk. This issue has been traced to a single battery supplier that produced batteries with a manufacturing defect. While the possibility of an incident is rare, the likelihood increases as the battery ages. 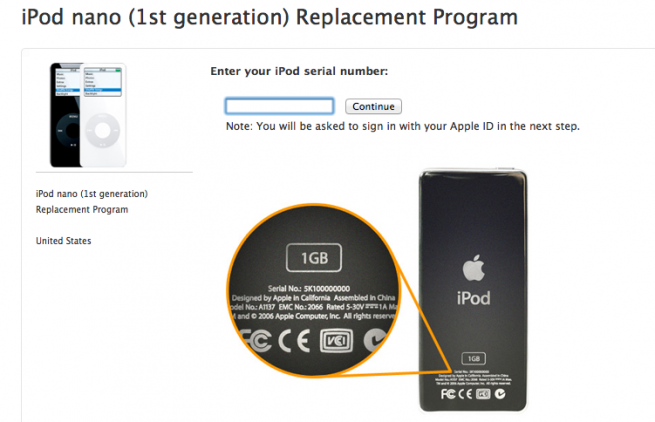 Because of the Apple recommends that you stop using your iPod nano (1st gen) and follow the process noted below to order a replacement unit, free of charge. If you would like to read this note in other languages click here.